Katie Fisher is ecstatic. Pro basketball star Brady James has proposed, and she can’t wait to start planning their life together. But it’s hard to focus on her own happily ever after when her calendar is filling up with celebrations for friends and family. Beyond that, it seems everyone around her has an opinion–and a strong one at that–on what Katie’s special day should look like. Will she ever manage to settle all of the details for her storybook wedding? Or will her overzealous friends and relations make a mess of everything? I have really enjoyed this series. It’s light and fun and this book met that as well. Janice has away for bringing weddings to life. And this book is full of them. I was getting so irritated with everyone trying to tell Katie how to have her wedding and I got irritated with Katie because she wouldn’t speak up. Everyone means well, but they are driving her crazy. I couldn’t wait to see how Katie and Brady would work out what they wanted for their wedding and would everyone be happy or would they give them a hard time about it? There is a lot going on in this book and a lot of people. You could read this as a stand alone but I don’t think you would appreciate it as much not reading the first two books, so I do recommend reading those first. Overall, a nice, light read, great for a summer afternoon. Katie Fisher and Brady James may be a match made in heaven, but that doesn’t seem to guarantee them a happily ever after accompanied by angelic choirs. In fact, the sounds being heard at the bridal shop where she works are on the contentious side lately, as a bride- and groom-to-be try to mediate the growing rivalry between their basketball-obsessed families in the middle of play-off season. On top of that, Katie’s parents are nagging her to get out of Dallas and come home to tiny Fairfield where her former boyfriend Carson is waiting for her, ready to rekindle their relationship. Oy vey! What’s a girl to do? And will she ever be able to wear that gorgeous wedding dress she won? 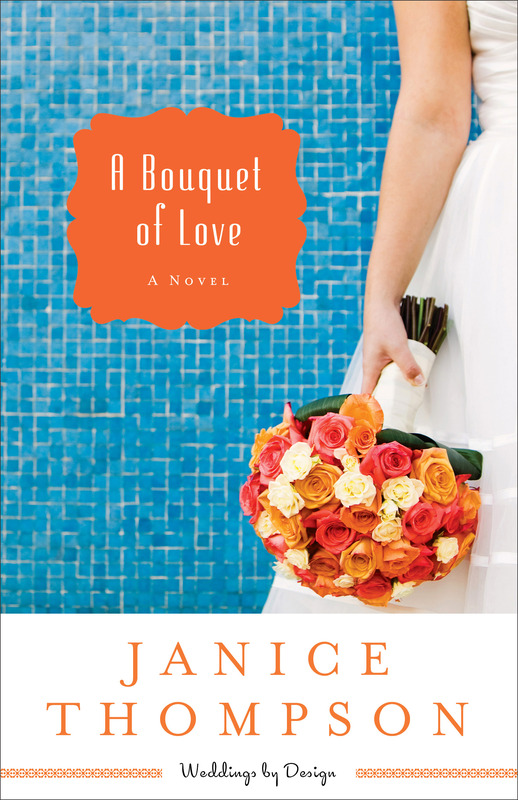 The breezy fun continues as Janice Thompson throws everyone’s favorite small-town girl into big-city bridal chaos–and makes her choose between the love she thought she lost and the love she stumbled upon in the aftermath. I love Janice’s writing, it’s so light and fun, yet packs a spiritual punch that will have you reflecting on your life as well. I so enjoyed meeting up with Katie again and her crazy family. This books takes us a bit deeper into the things that can cause problems in any relationship, the past, differences of opinion, and seasons. The was a resounding theme: seasons. We all go through different seasons and God wants to use those to grow us but it’s up to us how we react and Katie has to figure that out in this book. 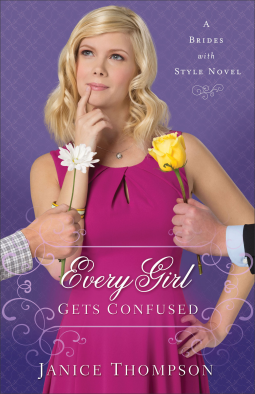 Katie’s ex-boyfriend shows up in this book and makes things more confusing for her as her family pulls her in different directions as well. Overall, Janice Thompson fans will not be disappointed with this newest release and if you are new to Janice I have no doubt you will find an author you will adore. Grab a copy at your local bookstore, Amazon, Barnes and Noble, Christianbook.com, or Books-A-Million. Big dreams take big leaps of faith . . . but what if you trip on the way? A lowly seamstress at a swanky bridal boutique, Gabi Delgado dreams of doing more than ripping out seams and fitting dresses to doe-eyed brides. She wants to see her own original dress designs gracing the young women of Texas. But when Jordan Singer, reporter for Texas Bride magazine, visits the shop to do a feature, Gabi is humbled in his influential–and unnervingly handsome–presence. Convinced she’ll never get her dreams off the ground now, Gabi needs lots of encouragement–especially from her friend Bella Neeley–to take a chance and start her business. And as she gets to know Jordan, she discovers that she may have to take a chance on love as well. 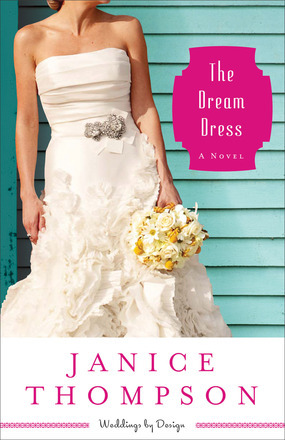 This is the first book I have read by Janice and I really liked it. I love her light style. But in saying that the message in the book is anything but light. 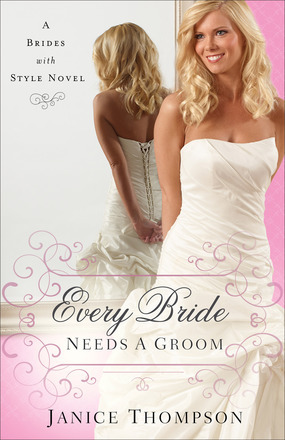 First of all, if you enjoy any of those wedding shows on TV you will love reading this book. You will feel like you are getting a sneak peak into those bridal salons. Gabi wants more and deserves more. She has been overlooked many times in her life, mostly by men. This has given her a warped idea of how men treat women and she has lumped all men into the same category. It began with her dad walking out on her and her mom when she was a kid and now she works for a man how doesn’t see her true abilities. Then she meets Jordan and he throws everything she thought she knew about men out the window. He’s kind and see’s her and her talent. He’s nothing like the other men in her life. Everyone around Gabi see’s her talent but she is in denial about her ability to really go on her own and become a designer. I can totally relate to this. I never felt like I was much of a piano player. I was good at singing and that was it, I even had a professor speak some very negative things to me. But when God gives us gifts He won’t let us hide them. Now I am a worship leader who sings and plays, I write music for the plays my students do and play them during the performance. I never sought out those opportunities but God guided me to them. And that is what He does with Gabi…but you’ll have to read the book to see how He accomplishes that. There is a strong spiritual thread that I did appreciate, but it could come across a bit preachy sometimes and maybe a bit contrived. However, I didn’t feel that this took away from the story at all. It is a great story I flew right through. Grab your copy at your local bookstore, Amazon, Barnes and Noble, Christianbook.com, or Books-A-Million.